Hoof it! has been created and written around seven key lessons pertaining to your Journey of Success, with each lesson being reinforced from chapter to chapter. Like a good story with a message? This is a charming and imaginative business and life parable centred around Vic, an orphaned wildebeest, who must endure the challenges and dangers of his first Journey. Hoof it! offers a simple, effective and practical approach for your Journey of Success both now and in the future. Need to know what are your next steps to take? Discover new insights. Create a new plan. Live it. Progress your Journey. And when you do, you will know what success truly means for you - and how to achieve it. 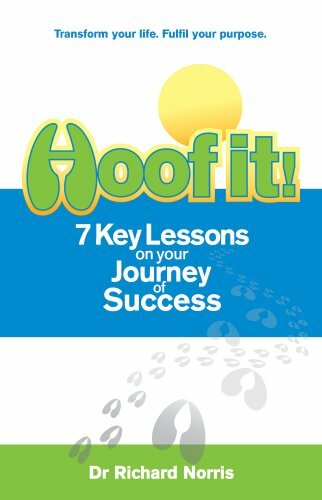 Now all that remains is for you to begin to... Hoof it! Richard's purpose is to bring transformation to people's lives so that they are living to fulfill their purpose whether at work, rest or play. From a veterinarian delivering calves and doing eyelid surgery on leopards to an army officer responsible for security and animal welfare to a post-grad student in internal medicine and an MBA to unemployed to an award-winning business coach and business development strategist, Richard's own success journey has been dynamic and diverse. Along the way he has also captained, coached and motivated sports individuals and teams to realize their potential. What became apparent is that Richard truly excels at challenging the status quo and clients to be better, to do better and to attain better results across their lives, businesses and organizations. That applies whether working with entrepreneurs or executives, leaders or followers, individuals or teams. Richard contributes articles to various publications online and in print on a range of topics around business, leadership and personal success. He also presents, speaks, and lectures across various institutions, conferences and events around the globe. As a competitive swimmer for 23 years, Richard lives by the adage a healthy body is a healthy mind. Today Richard continues to get his endorphin fix whether in the gym, on the road or in a pool. Richard is a lifelong learner and has invested significantly in his own personal development. He understands the power of applied learning that allows for growth and delivers results simply, effectively and consistently. With an absolute belief that inside everyone is greatness, Richard, by example and passion, uniquely inspires this belief in others.